Safety training programs often focus on incident prevention; while this is imperative knowledge, it must be coupled with incident response to fully protect your employees and facilities. 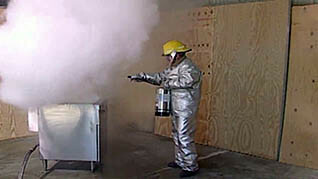 Fire safety training is no exception. With more than 150 fires occurring every day at work, proper extinguisher use is a much-needed skill. “Fire Extinguishers: Ready to Respond” teaches your employees about the causes of fires, what fuels them and what is needed to extinguish them. There are five classes of fire and each requires a different type of extinguisher. This is both cost-saving and potentially lifesaving knowledge to possess. Increase your employee’s awareness and knowledge, and bolster your incident response capabilities with this comprehensive safety-training course.